You are here: Home » Articles » Is It Time to Buy Gold? A few months back, I read an interview with legendary investor Jim Rogers. In the 1970s and together with partner George Soros, Rogers soared to fame and fortune with the Quantum Fund — a private investment fund that, in ten years, gained 4,200% (47% annualized). How did he do it? In the 1970s, stocks moved up and down — sometimes violently (sound familiar?) — but essentially ended the decade flat. The Dow opened on January 1, 1970 at 800.36 and closed ten years later at 838.74, a mere 4.8% higher (0.47% annualized). Commodities, on the other hand, had an amazing run in that decade, and Rogers capitalized on it. Take gold, for example. From January 1970 through December 1979, gold prices grew from $34.94 to $455.08 — 1,202%, or 29.3% a year (using monthly averages). And the commodities bull market wasn’t limited to gold — virtually all commodities soared, in large part due to a number of factors including high inflation, middle-east instability, a falling dollar, and large and growing US trade and budget deficits. Rogers and Soros took advantage of this trend to make huge sums of money by placing strategic, and highly leveraged, bets on commodities and currencies around the world. Before you decide if today’s deficits, instability, and monetary easing is reason enough to buy gold, it’s important to understand how commodities are priced and what would cause commodity prices to rise or fall in the future. I’ve discussed commodities in the past, saying that some laws can’t be broken, discussing what affects commodities prices, and exploring how to value a commodity. The short-short version: the $1,413 price you would pay for an ounce of gold today isn’t pulled out of thin air, but is based on a number of factors that coalesce to set the market price on any given day. Understanding that is critical not only to investing in commodities, but in any investment. After all, this knowledge is at the crux of value investing as well. How else could we purchase stocks at significant discounts to intrinsic value if the prices were based solely on fundamental data rather than on a number of factors including speculation, fear, greed, industry trends, etc? Like they did throughout the 1970s, gold prices continued to rise through the first three quarters of 1980. By September of 1980, the average price for gold hit $673.62, up 1,828% from just a decade earlier. Though many will tell you that gold is the investment to buy when facing economic turmoil and political uncertainty, the reality is that such “advice” is usually provided by economists, advisors, and theorists who have little understanding of intelligent investing and are often too afraid to buy stocks precisely when they offer the most attractive returns — that is, when they’re the cheapest! Though the following is not the most scientific study, I’m sure you can appreciate the relevance. I love Google’s News Archive feature. Punch in a search term, set a date or range of dates, and find news articles from the past. It’s how I came up with all of the gems at the end of this article. In the last thirty years of the last century, gold’s popularity peaked in 1980 — precisely as it bubbled over an all-time high. Interest rates were near an all-time high. Inflation was raging in the double digits. A recession was months away. It was the “perfect case for gold” according to many. And yet what followed was a slow-motion, two-decade long crash in gold. It wouldn’t see $675 an ounce again until 2005 — 25 years later. Odds are, you’ve seen and heard a ton of advertisements for and news articles about gold over the past few years. Starting in mid-2001, gold has grossly out-performed the broad stock market indices, increasing four-fold versus the S&P 500’s 0% return. In fact, the case can be made for other commodities as well. 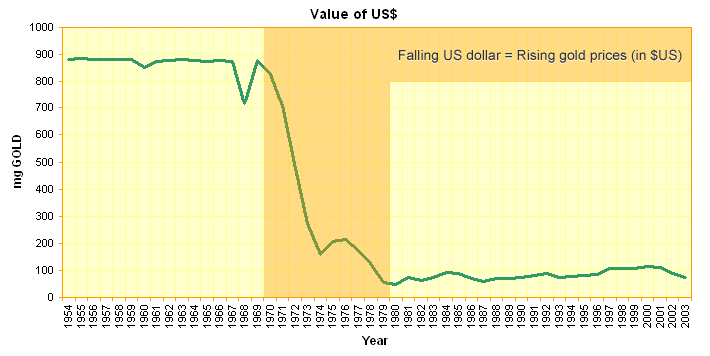 The dollar’s decline, which started in the early 2000s, served to naturally increase the prices of commodities priced in dollars. So is it too late to invest in gold and enjoy the ride? I don’t know how you can call it a bubble. A bubble is when everyone and his mother owns gold. Today, most people still don’t own gold. Rogers is right. In the dot-com bubble, everyone was a trader, dancing in and out of stocks and options on a daily or hourly basis. In the real estate bubble, everyone was flipping condos and houses like they were short-order cooks at an IHOP. This being true, a case can be made that it is not too late to invest in gold — that gold has not hit the top of its bubble because the hyper-greed that typically accompanies the top of a bubble is not yet present. Look, you could take all the gold that’s ever been mined, and it would fill a cube 67 feet in each direction. For what that’s worth at current gold prices, you could buy all — not some — all of the farmland in the United States. Plus, you could buy 10 Exxon Mobils, plus have $1 trillion of walking-around money. Or you could have a big cube of metal. Which would you take? Which is going to produce more value? Like always, he’s got a point too. Long-term (meaning over the course of two or three decades), you have been and probably will be better off buying pieces of businesses (stocks) than investing in gold or other commodities, especially if you are paying a fair or bargain price for your businesses. That’s because, long-term, businesses will grow at the rate at which they can increase their intrinsic value and reinvest their excess cash / grow their assets. Commodities will grow at the rate of inflation, plus or minus long-term valuations in the currency and long-term changes in supply and demand. If you do buy gold today, I’d spend as little time as possible watching the gold market and as much time as possible talking to neighbors and watching movies. Gold probably isn’t at the top of a bubble yet. When it is, you’ll know it not because of the price, but because your neighbors and coworkers will be extolling gold’s benefits, and movies about dirty, hot-shot billionaires will be about commodities traders, not stock brokers.